lse start at his first marketing job out of college ended up giving Matthew Razey his first thoughts of becoming an entrepreneur. After four years building a successful marketing career with another company, he knew it was finally the right time to start his own business. After looking at other opportunities, Matthew decided to join the Shack Shine team. 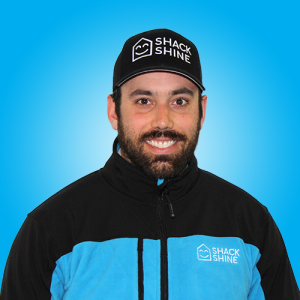 Here, he explains why he chose Shack Shine and what he’s looking forward to in his new adventure as a business owner. I always knew I wanted to run my own business and now just felt like the right time. I looked at a number of opportunities, but ultimately chose Shack Shine. I knew that learning or creating the systems in my business was going to be a challenge. Shack Shine gave me a chance to lower a lot of those hurdles I was in for, as I transition to a new role as a business owner. With Shack Shine, I get to enjoy the limitless opportunity and unclaimed territory that typically comes with a new system, but I also get the comfort of being able to rely on the proven systems and support network. My first job out of college was with a marketing organization that was designed to grow by developing business owners to manage large sales and marketing teams in a “pyramid shaped” structure. The opportunity did not ultimately work out, but it taught me more about sales, leadership, and accountability in two years than most companies teach in a lifetime. It wasn’t glamorous, but I am very grateful to have been naive enough at the time to pursue it. It granted me the skills and knowledge to pursue a successful career in marketing with a well-known building products manufacturer. It also planted the initial seed of entrepreneurial desire, which eventually grew into this opportunity. I am incredibly excited to be able to grow as big or small as I want to. That’s a freedom only available to those who are willing to make the sacrifices that others aren’t willing to make. Working in a corporate job for the last couple of years has exposed me to how invaluable that opportunity really is. I was a stand-up comedian for a long-time. The experience is the first time I can remember saying, “Wow, I am doing something I didn’t know I could do.” Though I’m not active in it now, I’m still passionate about my jokes landing in conversations! My new community is a whole new world to me. I am originally from Philadelphia, and traveled here with an expansion crew with my very first company to start a new territory. Once I was here, I fell in love with the culture, as well as my current girlfriend. She is originally from the North Chicago suburbs, and since we’ve met, we’ve moved to many different areas of the country, including Minnesota and New Jersey. Since I left Chicago the very first time, I always knew we would end up back here together. There is something special about each town here—they all have their own unique identity and culture. I quickly reached the realization that this is where I wanted my kids grow up. These are all great communities with some of the best examples of pride of their community, neighborhood, and history. I consider it an honor to contribute by offering the community a great service and employment opportunities. My dad taught me a lot and is a great example of what it takes to build your own success story. He did not have much going on when he first entered the workforce. It’s inspiring to see the challenges that can be overcome when the desire is strong enough. I once entered a pizza eating contest and came in second place. Two full 18 inch pizzas was the count for me. The event was part of an anti-bullying festival that the radio station I was working for was sponsoring. I felt disgusting, but it was for a good cause!